GlaxoSmithKline (GSK) just announced a recycling program for its inhalers. Quite a few people, including many of us, our elder parents, and our children, use inhaled medication, often over many years. As a result asthma sufferers do not have to think much about their potential breathing difficulties. 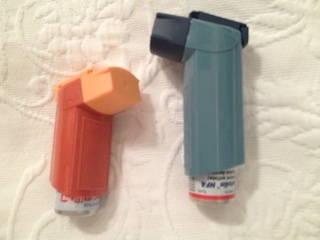 Until now as each person finished an inhaler, it went into the trash — the little metal pressurized aerosol canister as well as the plastic sheath. Given the number of people nationwide (and I am not even considering worldwide consumption), these discarded inhalers must add up to massive piles of plastic mouthpieces and metal canisters filled with medication residue in landfills. Learn more about the GlaxoSmithKline recycling program at Complete the Cycle. Already set to go in 31 United States markets, the GSK recycling program expects to continue to add more markets in the coming months. Additionally GSK plans to release a list of participating pharmacies on November 1, 2012. Patients bring empty GSK respiratory inhalers to their pharmacy and place them in a container. Once the boxes are full, pharmacies send them (shipping is pre-paid) directly to a specialized recycler where the inhalers are sorted, disassembled, and recycled. Plastics will be used to make new household plastic products, such as hangers and flower pots. The remaining gas is recovered and reused, and the metal from the canisters is recycled. The inhalers will not be recycled to produce new inhalers. This is just the sort of recycling that my northern Virginia community pharmacies would enthusiastically join. It sure would be really cool if GSK would simply accept all inhalers for recycling and make an even bigger statement about its environmental commitment. Could you please set up an inhaler recycling program in Fresno. Worst city in US for asthma , many inhalers going in trash. I wish I had the influence to set up inhaler recycling programs! You will need to check with a local pharmacist to see what is available in your area. « Empowering Through Design: What a Health-Wellness Concept!